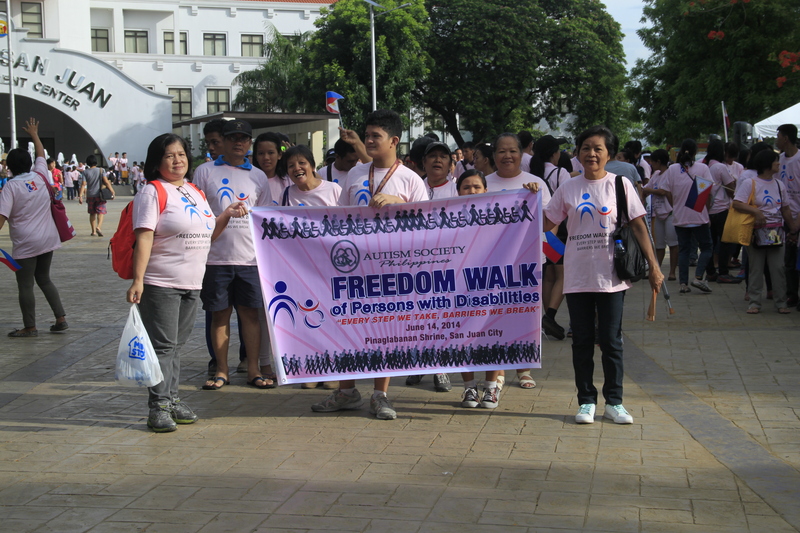 The Autism Society Philippines once again joined the annual Freedom Walk of PWDs held at San Juan City last June 14, 2014. ASP is led by its Program Coordinator and Freedom Walk Technical Working Group member, Raph Torralba and members of Tandang Sora, Makati, and Pasay Chapter. Now on its 4th year, the Walk, with the theme “Every step we take, barriers we break”, attracted more than 2,000 walkers composed of PWD organizations, local government units, government agencies and private sector such as LGU of San Juan, Taguig, Pasay, and Mandaluyong, AKAP Pinoy, PFRD, NCDA, Senate of the Philippines, DSWD, DPWH, DOTC,DENR, MIAA, PIA, PNP, BFP, NVRP, PACDLD, Physicians for Peace, Archdiocese of Manila Ministry on PWD, Citibank, JP Morgan, SM CARES, PARM, and CBM. San Juan City Mayor, Guia Gomez welcomed all the guests and participants to the city. This yearly walk is being organized by the AKAP Pinoy with PFRD as this year’s Chair. The goal of this activity is to raise awareness of the general populace on the importance of the United Nations Convention on the Rights of PWDs as well as to encourage local government units to establish Persons with Disabilities Affairs Office (PDAO) as mandated by the RA 10070. The Walk is also an expression of the PWDs’ desire to be free from chains of discrimination, inequalities and poverty and has persuaded the them to be united as one in advocating for the recognition of their rights and the responsibility of the government to enable them to live independently and participate fully.